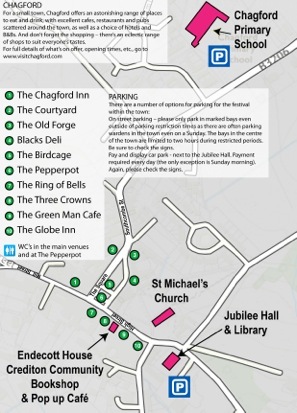 For ease and accessibility we limit the venues for the festival to two spaces: the adult events are all held in the JUBILEE HALL and the children’s events are in CHAGFORD PRIMARY SCHOOL. * on the Saturday and Sunday of the festival weekend, at Chagford Primary School (free). Endecott House, opposite St Michael’s Church, is the site of the POP-UP BOOKSHOP AND FESTIVAL CAFÉ. Chagford offers a wide range of excellent places to eat and drink. Full details can be found on www.visitchagford.com.